My name is Adrián Maldonado and I’m thrilled to introduce myself as the new Glenmorangie Research Fellow here at National Museums Scotland. I will be taking forward the next phase of the highly successful Glenmorangie Research Project, now entering its tenth year, entitled Creating Scotland: Making a Medieval Kingdom. We will be looking at a critical period in the formation of Scottish identity: the 9-12th centuries, from the Viking invasions to the establishment of the kingdom of Scotland as we know it. You can read more about the project here. 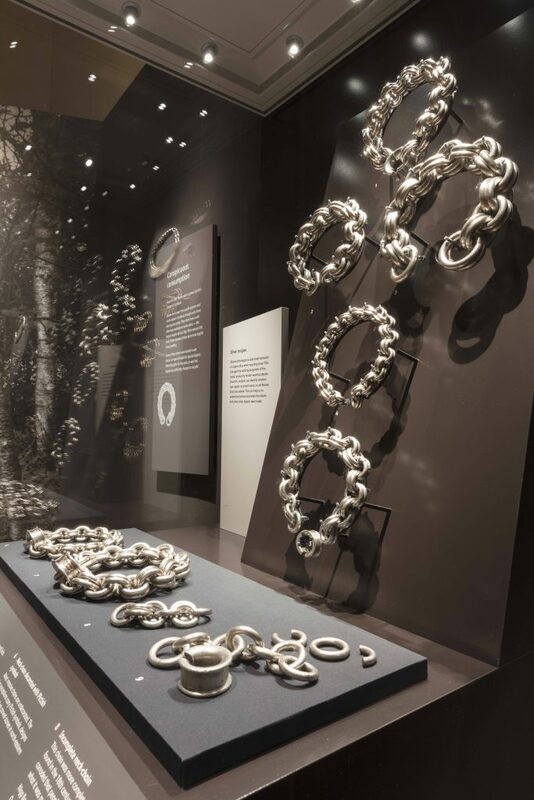 Six massive silver chains discovered in different locations throughout Scotland, on display in the Scotland’s Early Silver exhibition. As an archaeologist of the early medieval period, I’ve been a big fan of this project over the last nine years, and it is beyond exciting to be part of it. My research to date has been on early medieval burials and carved stones, and the archives of many of the excavations I am dealing with are housed right here in the national collection. In the first week I stood in the presence of the famous silver chains and the Gaulcross Hoard – not behind glass! – as our conservationists began new scientific analysis. If it is possible to be starstruck by an artefact, that has been me since starting the job. Silver from the Gaulcross hoard. I will be tagging along with the incredible Scotland’s Early Silver exhibition as it tours the country beginning this summer. But my main focus will be on the turn of the first millennium, which presents some pretty big challenges as an archaeologist. The historical sources for much of Scotland become very patchy, and the nature of the artefacts we find changes considerably. In a period already known as the Dark Ages, these centuries are about as dark as they get. 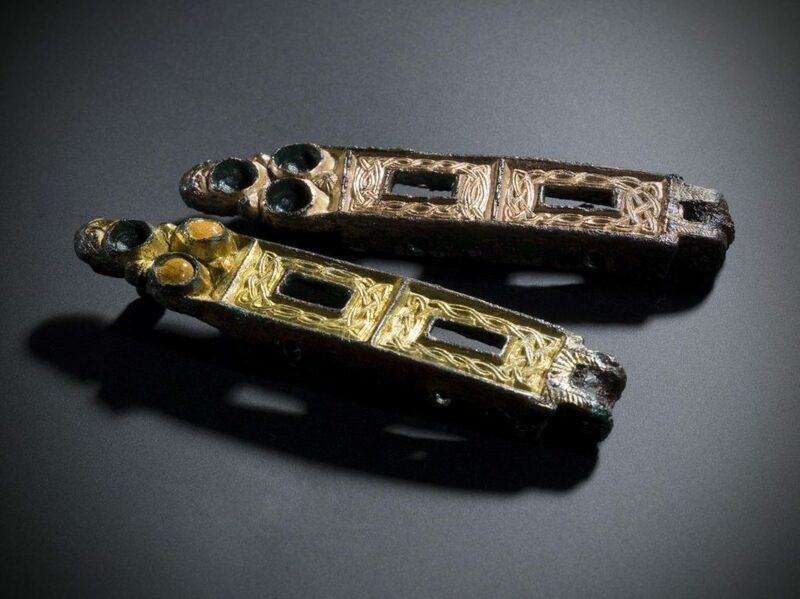 Two hinge-fasteners from an Insular house-shaped shrine, 8th century, later converted for use as brooches in the Viking burial at Carn A’ Bharraich, Oronsay, 9th century. Yet our collection has over 1,000 artefacts dated to this period, and perhaps many more which can be identified with the benefit of new scientific techniques and our world-leading research connections. And new material is coming in which is forcing us to rethink our assumptions of this period. Objects from the spectacular Galloway Hoard, acquired by National Museums Scotland in 2017. By the 12th century when we have an explosion of new evidence, we have gone from a patchwork of regional powers to a more unified kingdom of Scots. 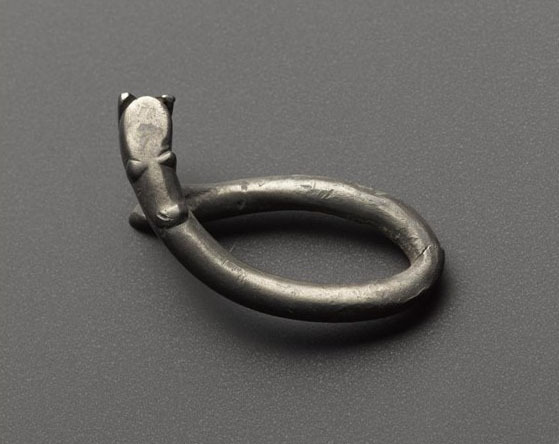 The archaeology tells a fascinating story of transformation, but not always the upheaval we imagine when we think of Viking raids and their aftermath. The continuities will be as interesting as the changes when we are looking to our collection for answers. 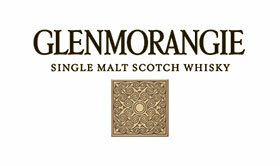 I will be taking you all on this voyage of discovery with me, through regular updates on this blog. You can also follow me on Twitter as I share all the new insights I’m getting from working in Scotland’s greatest collection. I have been in awe of your professionalism, dedication, perseverance and accomplishments throughout all these years. I wish you the boundless success you so richly deserve. I think it is so interesting to be able to learn from one of my dear students. Enjoy your journey and keep us posted! Interesting blog. You showed the excellence in arts and imagination through beautiful silver sculptures. You can also enjoy various driftwood sculptures from https://www.bayislandmuseum.com/, visit and enjoy it also. It would be interesting to hear where the large amount of silver in the collection was originally mined. Is it possible to look for a geological signature in silver in the same way as is done with the impurities in gold? Or perhaps the isotope ratios vary from different sources?